With the normal thrum of busy lives it can be tough to take time to make a real meal with fresh ingredients. But I hate to miss out on the late summer produce that’s so plentiful this time of year. I especially hate to miss out on in-season tomatoes. They don’t even have to be fancy heirloom varieties, beefsteaks from the garden (or your neighbor’s garden, or the farmers market, or anywhere that carries actual local and in-season tomatoes) are worth celebrating on their own. 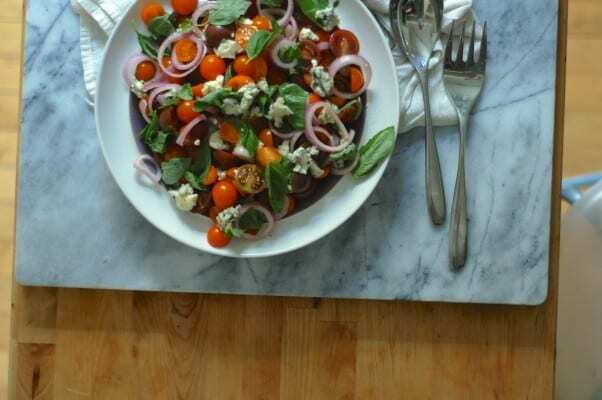 Which is why I’ve increasingly relied on simple meals like this tomato salad. It comes from Suzanne Goin’s Sunday Suppers at Lucques, which is one of my favorite cookbooks for seasonal cooking with an easy elegance. It’s a salad without lettuce or field greens, and it’s not for the faint of heart. Goin says it is based on a classic steakhouse salad, but I’ll admit I’ve spent little time in steakhouses and had never seen this on a menu that I can recall. I think of it as caprese salad’s brash cousin. 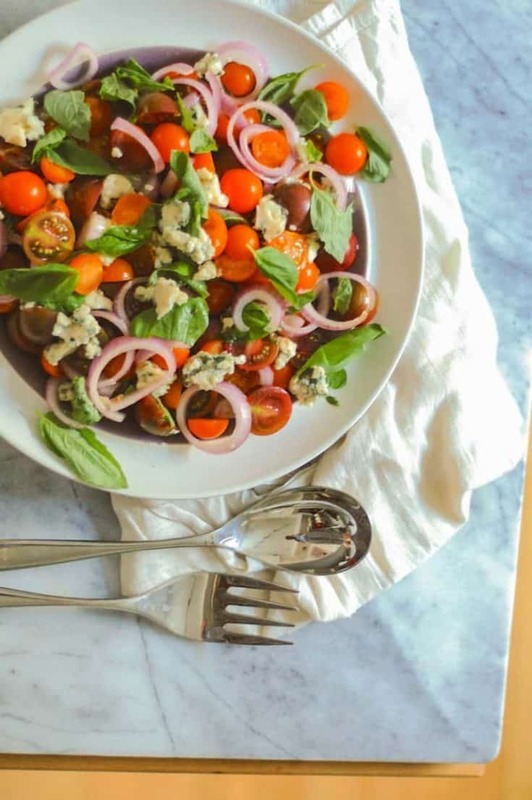 The tomatoes and the basil are the same, but instead of mozzarella there’s bold blue Roquefort cheese and slices of red onions that have been soaked in ice water to amplify their crunch and remove their sting. It’s all tossed in a vinaigrette made from bashed up garlic and oregano with both red wine and balsamic vinegar and some high quality olive oil. It’s hard to beat this one for simplicity. And the ratio of flavor to effort makes this a clear winner. It packs a wallop. I can see how it would stand up to steak or any big flavored protein, but we had it for a meal all by itself. It’s a salad I’ll turn to again and again. 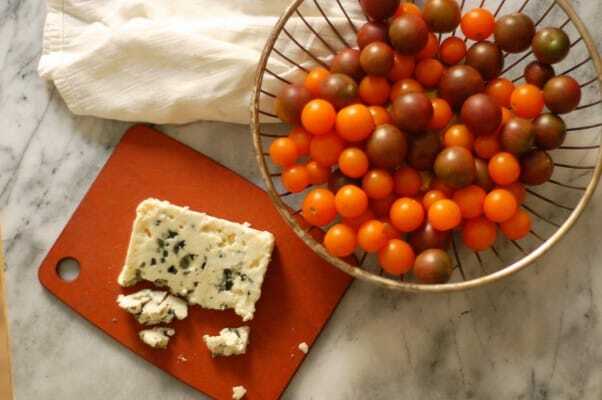 This is a bold flavored salad for people who love both tomatoes and blue cheese. I’ve simplified the method here so that the salad is tossed rather than carefully arranged on a plate. Goin uses Early Girl tomatoes, but I’ve opted for a mix of cherry tomatoes, which only need to be halved and can stand up to tossing better than big tomato slices can. 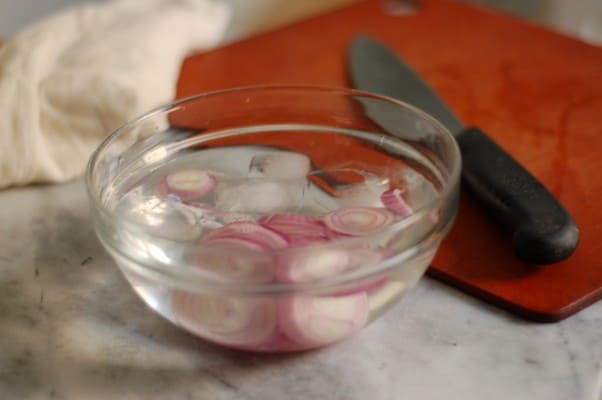 The red onion here provides a wonderful crunch, and after soaking in ice water and getting squeezed with lemon, it gets noticeably mellower than a typical raw onion. The vinaigrette gets its flavor from both red wine and balsamic vinegars, garlic and fresh oregano, and olive oil. It’s worth it to spring for a good quality olive oil here. If you have another favorite blue cheese, you can use that instead of Roquefort. 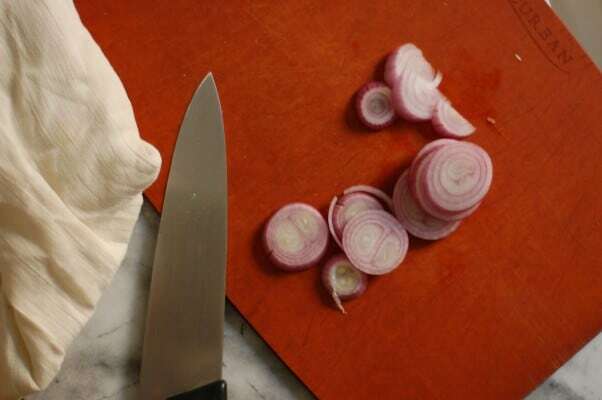 Peel the onion and slice into 1/4-inch-thick rings. Soak the rings in a bowl of ice water for about 10 minutes. This will keep the crisp while mellowing the harsh raw onion flavor. 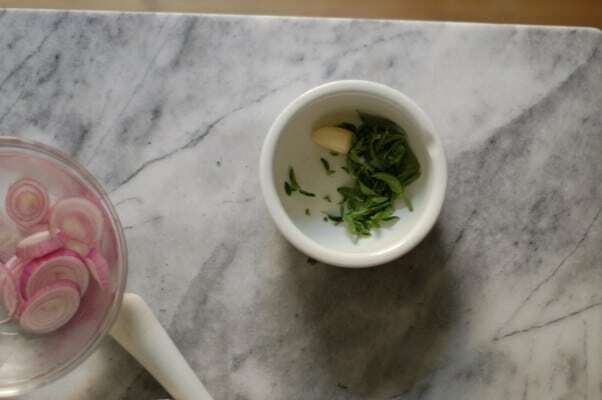 In a mortar, pound the oregano, garlic, and 1/4 teaspoon salt until they form a paste. Transfer to a small mixing bowl and stir in the red wine and balsamic vinegars and whisk in the olive oil. Drain the onions, add them to a large mixing bowl and squeeze the lemon over them and sprinkle them with salt and teaspoon of vinaigrette. 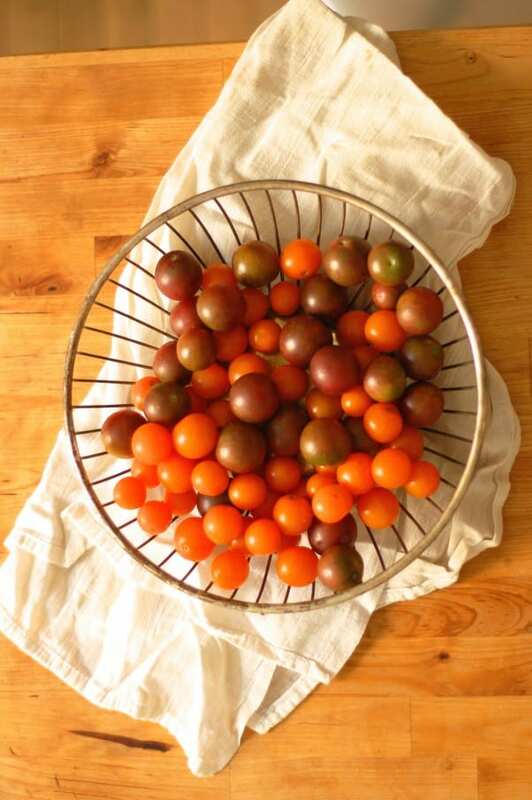 Sprinkle the halved cherry tomatoes with sea salt and black pepper and add them to the bowl. Cut the cheese into rough 1/4- to 1/2-inch chunks. Add the vinaigrette and toss until the salad is coated. 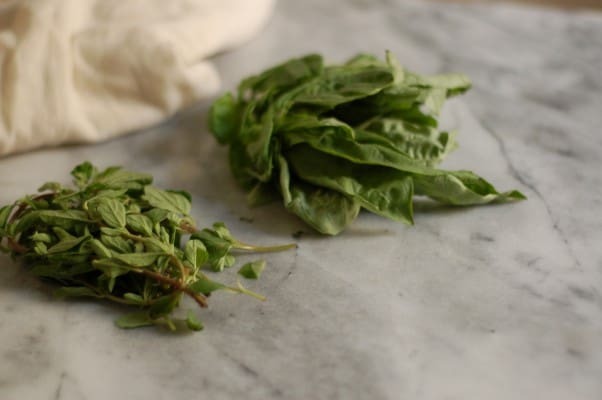 Tear the basil into pieces and sprinkle it over the salad. Serve immediately.